Sometimes You Just Have to Bribe Them! Was seeing nothing but a few finches - so thought it was time to toss in a few peanuts to the seed mix. Gave it 5 minutes and got my shot for today (after he ate the first two peanuts too quickly for me to catch - glad I put in 5) Times are getting desperate. Wonderful capture. Such vivid colors! Beautiful. I love these cheeky birds! Fabulous colour! Perfect shot...they can grab&go fast when it comes to peanuts! Amazing capture with that color and clarity. Smart! I may have to try that with our ravens. I just can't get them to stand still! I have a bird feeder just so when I want I can sit and take pictures. I figure the birds get food I get pics it's a good trade. I loved feeding the bluejays when we were at my daughter's in Canada. They're so pretty. Pretty capture............nice to photograph him with the peanut! Congratulations Melanie on making the TT with this great capture! 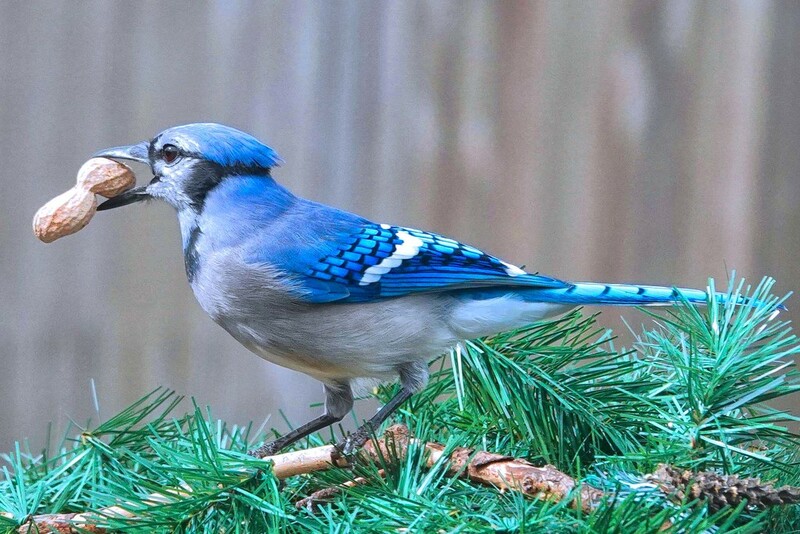 My blue jays grab the peanuts from the squirrels. Then the squirrels eat the bird food...haha!